ClearSy is an expert in safety critical systems for the railway industry. From design to commissioning, ClearSy develops and installs certified vital software and systems for trains, metros, commuter trains, light rails and rail infrastructures worldwide. In their effort to provide fully turn-key systems, ClearSy engineers pass SIL certification for their clients before delivery (according to standards EN 50126, EN 50128, EN 50129, 61508). As a leading expert in rail safety, ClearSy proposes products and consulting to ensure safety, availability of rail systems and reduce cost of safety development. ClearSy has been established to promote formal B method for industrial applications since 2001. Today, it is a reference in the field and now proposes development and support in a formal method (based on mathematical proofs). ClearSy offers a range of products to increase flow and safety of passenger in urban transportation systems. Its systems are in operation in Paris, Stockholm, Sao Paulo, Los Teques, Lyon and Bordeaux … These systems are designed to combine safety and availability in order to fully address the needs of the most crowded public transportation network. Platform screen doors / Automatic platform gates controller: these systems prevent ingression into the track and increase fluidity. Their solutions are suitable for existing and new trains. Track intrusion detection system: it detects human ingression into the track. Positioning system: it ensures correct stopping position of the train before train doors opening. Gap filler: it fills the gap between train and platform and detects person in the gap between platform gates and train doors. Level boarding, Bridge plate: they ease ingress and egress of passengers. Automatic train stop (ATS) and automatic train operation (ATO): these systems are automatic train braking systems use to prevent overrun of restricted signal and overspeed. They are in operation in RATP lines in Paris, Santiago, Baku …. Train detection / train location: It is used to detect passage of a train. Axle counter: it is an alternative to track circuit and is less affected by environment. Flat tire monitor, Hot box and dragging equipment detector. Master monitoring system, high performance SCADA especially designed for railway operation. ClearSy has developed cheaper alternative products for vital application. They are also committed to reduce cost of critical software and system development. Vital SIL4 certified relays: these relays are guaranteed to open and they don’t use gravity. Consequently, they are very compact. 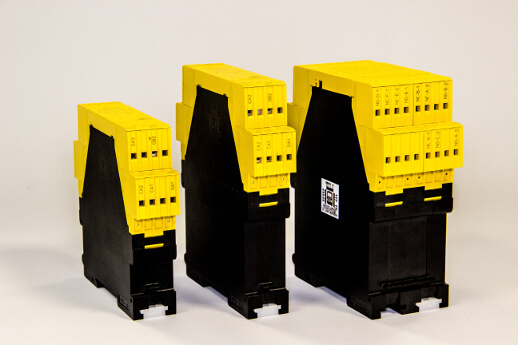 These safety relays fit onboard and trackside application. Fail safe remote I/O: it brings command closer to actuators and reduces wiring for onboard and trackside application. System can handle different safety level system on the same network. LCHIP: It is a hardware/software platform (PLC) for SIL4 application. It eases critical software development and reduces drastically their cost. Currently in research and development. ClearSy has acquired a strong expertise in advanced rail safety and now it offers services. In safety, B formal method is a strong asset. For example, ClearSy proved the CBTC of the NYCT line 7 is totally safe at system level. Also, B method is used to design safety critical software of CBTC driverless by major companies. When it comes to train management system, ClearSy engineers have already assisted clients in their ERTMS and CBTC projects by developing interlocking or writing specifications. ClearSy provides training in B Method and for ERTMS/ETCS.